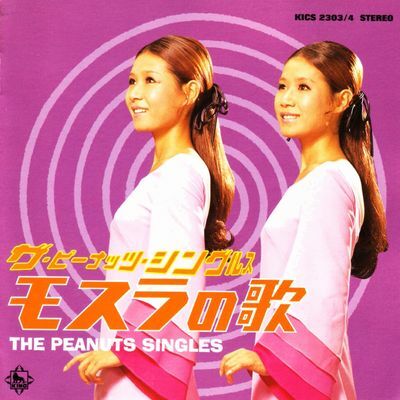 The Peanuts (ザ・ピーナッツ) is a Japanese pop duo consisting of twin sisters Emi Itō (伊藤エミ) and Yumi Itō (伊藤ユミ). They were born in Tokoname, Aichi, (Japan) on April 1, 1941. Watanabe Pro founder Sho Watanabe first saw them performing at a club in Nagoya as the “Ito Sisters”. He brought them to Tokyo in 1958, where they were dubbed “The Peanuts”. Watanabe was able to get them work as presenters on the newly launched TV program “The Hit Parade”. 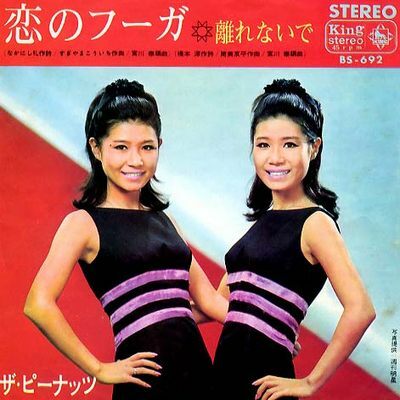 They made their successful recording debut with the single “Kawaii Hana (Cute Flower)” in April 1959 , and followed with the smash “Jyonetsu no Hana (Passion Flower)”. From 1961 thru 1972, they became the hostesses of TV show Shabondama Holiday” (Soap Bubble Holiday). 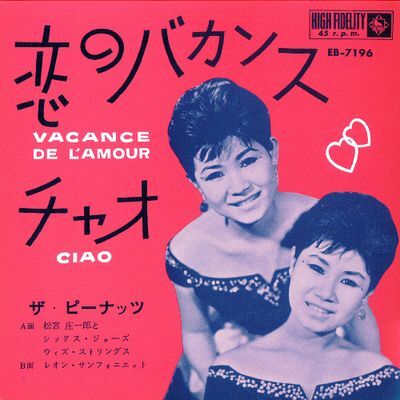 During this period they managed to release huge hits like “Koi no Bakansu (Vacation of Love)” or “Koi no Fuga”. However, what made The Peanuts most famous internationally was singing in monster movies, especially in three Mothra movies : Mothra (1961), Mothra vs. Godzilla (1964), and Ghidorah, the Three Headed Monster (1965). They appeared as fairies or pixies, called “shobijin” (small beauties) who had telepathic communication with Mothra, giving The Peanuts a somewhat supernatural aura.